I had a pretty big freak-out over this post because I realized that I didn’t have a gravy boat right before I was ready to start photographing it. In my head, I had a gravy boat. But in reality? No gravy boat. I found an article on gravy boat alternatives from The Kitchn, which was helpful, but while I could definitely serve gravy in a water pitcher, I couldn’t really photograph it in one because that would be weird, right? There’s nothing like a big, tall pitcher of thick, refreshing gravy. Pour me a glass, please! So I sent Chris to Target to buy me a gravy boat. He took pictures of each one they had in the store and I picked one out. Now I have a gravy boat for all my future gravy servin’ needs. Crisis averted! So if you too are a vegetarian that does not own a gravy boat, know that you can serve your gravy in a water pitcher or, failing that, send your better half to Target. Mashed potatoes are an important part of Thanksgiving and, as I always say, you just can’t have mashed potatoes without gravy. It would be a Thanksgiving travesty. 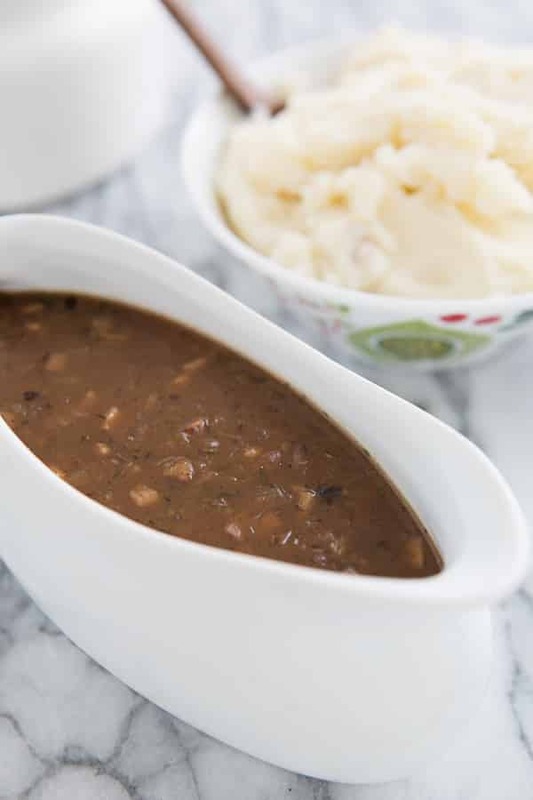 This Shallot and Shiitake Gravy can be made in advance and reheated later, so if you’re going to someone else’s house for dinner, you can bring it with you. Which is the second thing I always say! If you want to make sure you can eat your Thanksgiving dinner, offer to bring a dish or two. Your host will love you! And your fellow guests will probably steal your gravy. It’s really that good. When you cook down the mushroom stock, the flavor gets concentrated, so you end up with a gravy boat (or water pitcher) full of savory deliciousness that will rival any turkey gravy. 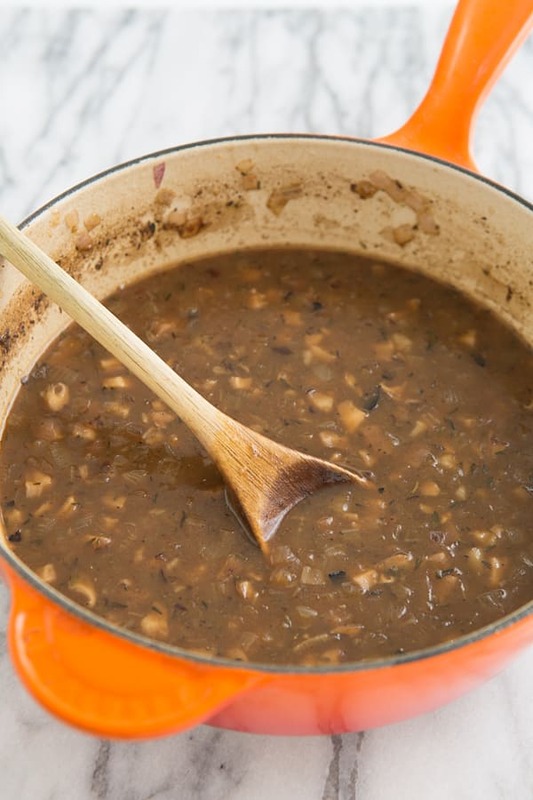 A vegan gravy for Thanksgiving made with shiitake mushrooms and shallots. Heat the oil in a medium saucepan over medium heat. Add the shallots and cook until browned, 7-10 minutes. Add the mushrooms and thyme and cook until the mushrooms release their juices, 2-5 minutes more. Pour in the wine and increase the heat to high. Once the wine has evaporated (1-2 minutes), pour in the mushroom stock. Bring to a boil, then continue to boil for 8-10 minutes, until the stock has reduced and thickened slightly. Whisk the water and flour in a small bowl. Pour the flour mixture into the gravy and reduce the heat to low. Simmer until the gravy thickens, about 2 minutes. The gravy will thicken even more as it cools. Season to taste with salt and pepper. I am so excited to try this for thanksgiving! I can’t find store bought mushroom stock and I’m not sure I have time to make it, so could I substitute veggie stock or would that just mess it up? Next year, I promise to be more prepared!! I haven’t tried veggie stock in this particular recipe, BUT I have used it in my other mushroom gravy recipe and it worked out just fine. So I think it should work. 🙂 It might be a little less mushroom-y though! have you ever tried making a big batch of this and freezing it? I made this yesterday for Thanksgiving. About half of us are vegetarians. Everyone LOVED this gravy. I’ve been a vegetarian for close to twenty years, and there are very few meat products that I miss, but at the holidays I’ve yearned for mashed potatoes with gravy. This was perfection. I substituted vegetable stock for the mushroom stock because I’m not a huge mushroom fan. Thanks for a really tasty recipe. Yes, I’ve made lots of gravies with onions instead of shallots. 🙂 You shouldn’t need to adjust the cooking time much (or at all).